A good night’s painting. 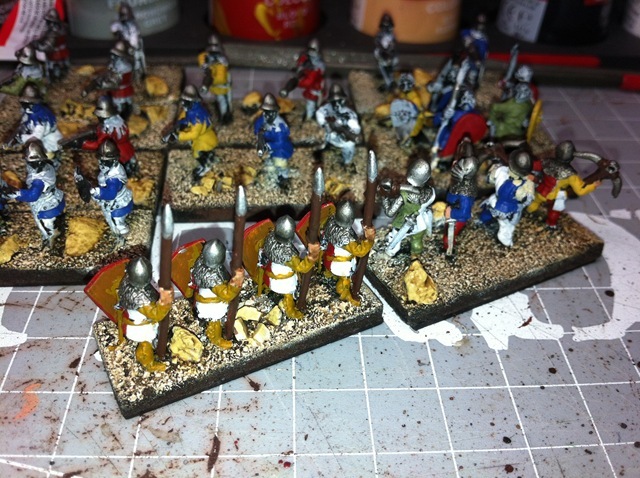 I kind of worked on all the infantry at the same time, finishing one element (the spears). OK, I know, there is no heraldry on the shields. That is one step to far in the time scale available. I’ll add that after CanCon 2013, especially if I can see some appropriate decals in the trader area at CanCon. Picture to the left is the painting progress last night. Whilst finishing the spears I splashed a fair bit of paint around on the hand-gunners and crossbowmen, as well as the blades (they are the guys with the nasty looking chopping things). I even managed to get some paint on to the warband. I am fairly certain that I will manage to finish the painting tonight, leaving the varnishing until tomorrow night. 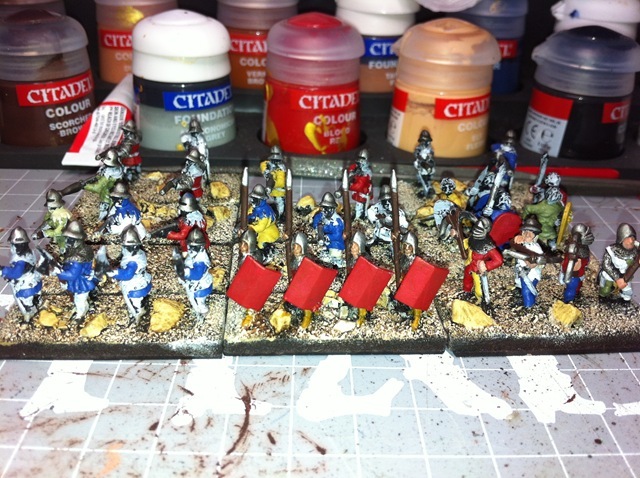 The photo to the right is the painting progress with a rear shot of the spears and crossbowmen. 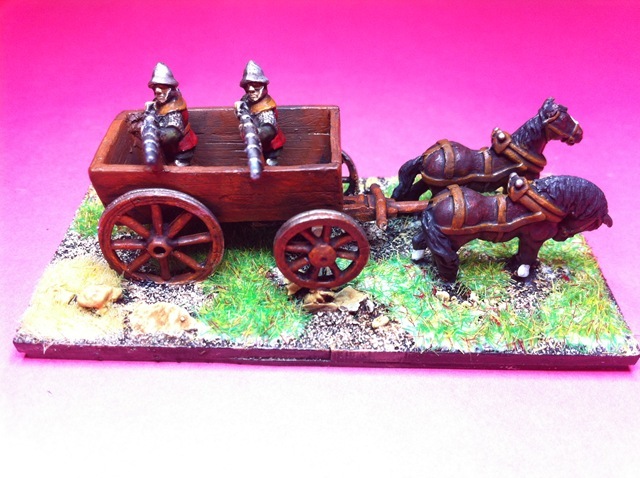 Lastly the photo below is one of the war wagons. I thought I would finish the base on it last night before retiring to bed so that I had at least one element finished. Actually, I am fairly pleased with the way it has come up although to be fair, the digital camera does hide a multitude of sins. Bother – I still have a camp to build/make – another last minute construction. Hopefully the next post will be them complete – or at least completed enough to put on the table at CanCon. I’ll post separately my comments about basing first and painting second – the long and the short of it is that it is a mixed bag – some things easier, some things more difficult.